The children in Shangilia want to learn and be enjoy a secure future based on a good education and skill set. Individuals, schools, businesses and foundations have different ways to support our work. You can either help with a donation or provide a sponsorship. If you opt for a sponsorship, you can choose between a child sponsorship and an education sponsorship program, in which you support a young person during his or her vocational training or during their studies. Contact us if you are unsure about how to best support Shangilia. 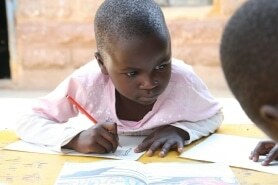 With a sponsorship, you will not only give a Shangilia child a better future, it is also the perfect gift. Through your regular contribution, you promote our work in a targeted way and will enable a child or adolescent on their way to independence. Regardless of which option you choose, your donation is tax deductible (at least in Germany). As a non-profit organization, we work voluntarily and your donation will benefit the project as a whole. For donations up to 50 euros, your bank account statement is considered as confirmation of receipt for the tax office. For donations of more than 50 Euro, we will send you an acknowledgment and receipt at the beginning of the year for your tax declaration.